In theory, July and August were supposed to be quiet months. We were supposed to have time to recover from the busy first half of the year, plus catch up on some of our outstanding chores. While July and August were a bit slower than the rest of 2015, by no means were they empty! We kicked off July with a Fourth of July event co-hosted between the American Women’s Club of Luxembourg (AWCL) and Democrats Abroad. Since the Fourth fell on a Saturday, the groups arranged a picnic at a lovely spot in Luxembourg. In the weeks before the event, there was much concern about the amount of indoor and/or covered space available at the location because Luxembourg tends to be quite rainy. However summer 2015 proved to be the second hottest on record and July 4th was the hottest day in July…. ever. (Well, at least since they started keeping records.) It was a high of 39°C, which is around 102°F. Add that to the fact that almost no homes have air-conditioning and you get a bunch of hot, tired people. Even under those conditions, the groups had a great day and the picnic was enjoyed by many. I will admit I was happy to have Sunday as a “rest day” to recover from the hot and busy Fourth. The second weekend in July was just want we wanted this summer –- lots of time on the bike. Saturday, we went north-east to the cobbles of Bourglinster. This is outside Bourglinster. You can’t stop for pictures on the cobbles! Sunday we went west towards the Belgian border. 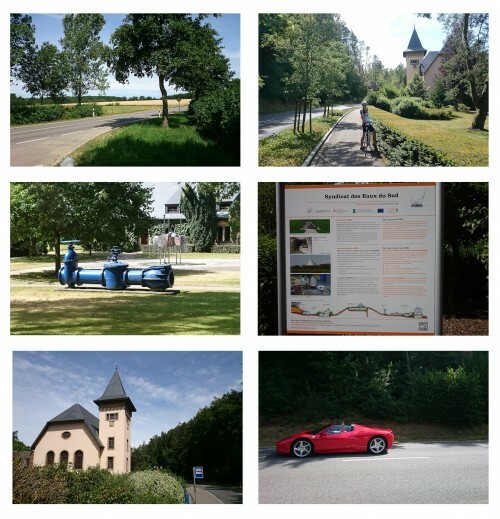 It was a new area for us to cycling and we came across something fascinating to both of us – the water works for the west of the country! My family has worked with the water department in my hometown for three generations (if you count my meter-reading as a child). 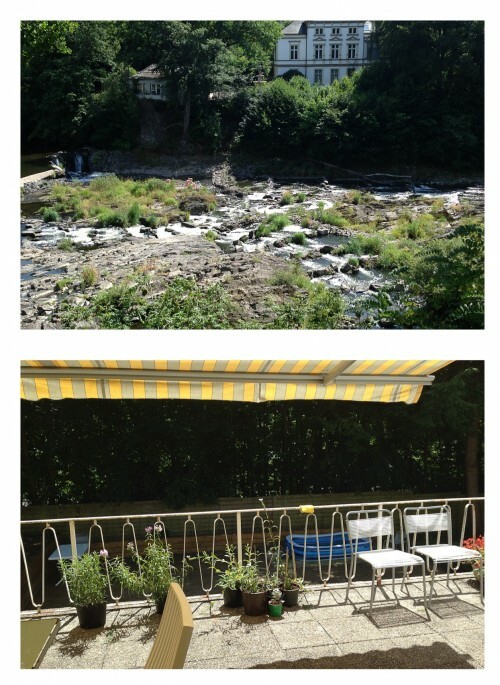 Will and I are enthralled with how Luxembourg stores the water in the hills, then pulls it out when necessary. It is so radically different than anything done in the part of the US where we lived that we just can’t get enough of it. We plan to go on tour of the facilities as soon as we can arrange it! We also happened to see some sort of Ferrari car club event – more amazing cars than we could count rolled down the road while we were admiring the water facility. You just never know what you will see when you are out and about in Luxembourg. 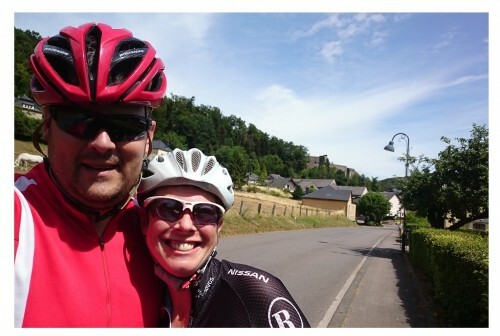 We also cycled through a town with a castle that day, so in honor of Rachel we stopped for a castle-selfie. I am sure we did something else enjoyable that weekend, but I only remember the cycling! The river had a nifty man-made “waterfall” area. Our host has an excellent patio just made for relaxing. We learned in late June that even more friends would be moving back to America. Not only was another set of friends moving on to a new adventure, we were losing another one of our dogs! First we lost Chester, then Willow, and now Hana would also be leaving Luxembourg. Even though our friends were busy preparing for the move, they asked us to join them for a dinner at Lea Linster’s. Will and I had heard many good things about the restaurant and its famous chef, so we jumped at the chance. There is nothing quite like a relaxing multi-course meal with friends, especially when the food is tremendously tasty. We were so pleased to have had the opportunity to share such a spectacular experience with good friends. One great part of being a member of the AWCL is that they organize the occasional Friday night happy hours. In late July, one was scheduled at the Abbey Neumunster, a lovely place to listen to live music and enjoy catching up with friends. Will was busy so I went directly after work. It was nice to see some old friends, meet some new ones, and then have the heat break with a huge rainstorm. Most of the crowd was drenched, but it was such a relief from the heat that no one really cared. The last Sunday in July found us out on the bikes, this time heading to the south of the country. We tried a new route when terminated in a forest. Since we were on our road bikes this was a bit of an issue. Thankfully, we both made it out without punctures, so in the end it wasn’t a tragedy. Still, we were a bit nervous for a few minutes…. This is not the surface you want when you are out on the road bike. Cycle paths are supposed to be paved, Luxembourg! Hana was moving to America but we didn’t want her to leave without staying at the BBB&B Kennel one last time. We happily offered to watch her when her owners went to the US on a home-finding trip. It has been great fun to see her go from an exuberant puppy to a well-behaved dog over the last five years. It was hard to say goodbye to our friends, but we know we’ll see them again both in person and electronically. I am thankful for the many forms of connectivity in 2015… including the Fitbit that shows me how much my friends are walking too. Hana’s color makes for a photography challenge, but I just keep trying. We miss her leans and her love. 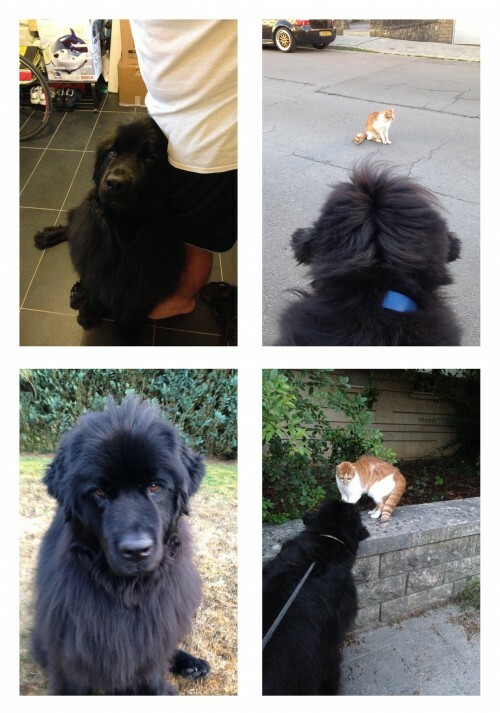 The neighborhood cat does not miss Hana. Normally, I try to avoid a lot of work talk in my posts. This time, I did want to note for “future Anita” that the last two weeks of July 2015 were absolutely hell at work. At the end of the month, however, we had 2012 audits finished and that nearly made it worthwhile. The heat continued into August. 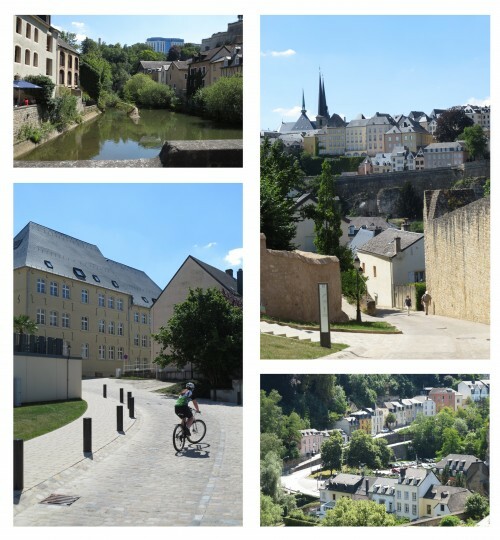 The first Saturday in August I talked Will into a simple afternoon of riding to explore Luxembourg. I am now the proud owner of a proper mountain bike (thanks Rachel!) rather than the hand-me-down I was riding from Will. 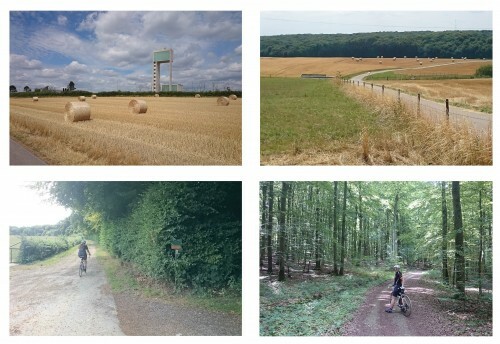 Due to all the other activity since May, I hadn’t had a lot of time in the saddle. I thought it would be fun to spend time on the mountain bike but spend it exploring the city. Plus, we wanted to send a video to our nephew, who left his training wheels behind this summer. We had a blast exploring some neighborhoods and making a short video. On Sunday we celebrated President Obama’s birthday with a delicious brunch… and a nap in the hammock. Really, it’s the only way to survive a too-hot summer. The next two weekends were spent either cycling or recovering from cycling. One Saturday we did the out-and-back to the north. Another Saturday found us out on the mountain bikes again, this time with our friend Roger. That afternoon ride ended with a relaxing afternoon and barbeque, which is always a treat. On any given weekend day, we did our best to take advantage of the amazing weather by cycling. The views from our ride with Roger was amazing. Before Rachel moved, we cycled here frequently. We need to get back out there more in 2016. As mentioned in another post, I had a significant birthday this year. 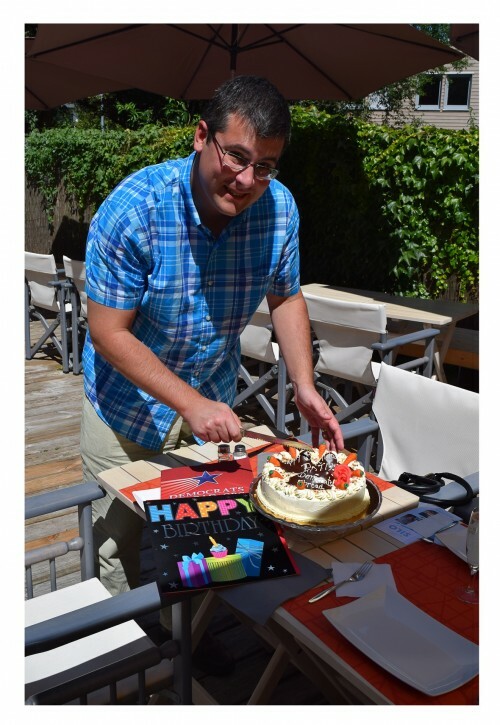 Will also had a significant birthday in August. In order to celebrate these momentous occasions, Giny and Roger suggested a weekend away in the Eifel in Germany. They have a lovely spot they like to visit and we joined them for three fun and beautiful days. We could swim, hike, and relax. In fact, I managed to relax so completely that I even took a nap! The weekend allowed us to recharge, plus play more Phase 10. I just know I’ll manage to win one of these times. The spot was so relaxing and beautiful. We even enjoyed a barbecue one night! 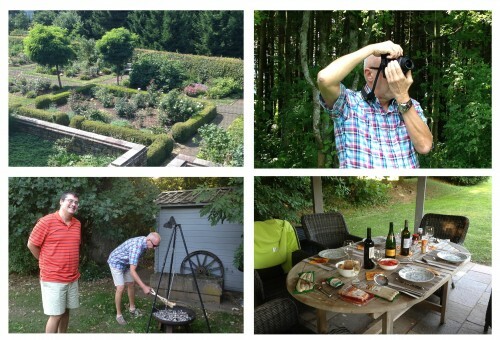 We closed out August with a last-minute work trip to the Netherlands. We departed early on Monday morning, spending most of the week in Zwolle. Will was able to get out on his bike and explore a bit, while I was in meetings. It’s always nice to be in Netherlands -– and not just for the stroopwafel McFlurries! 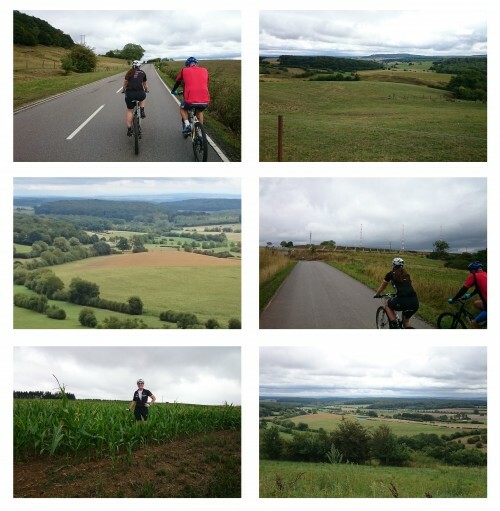 We were back in Luxembourg by the end of the week to close out August with some of our favorite things –- a happy hour at the Maine House and then two days of cycling. Thanks to the beautiful weather, I was able to ride nearly 350km during July and August. While that’s nothing to a professional, I’m proud that Will and I did get out on our bikes every possible weekend. Now, if only that would translate to weight loss… eh, we’ll save that for another time.